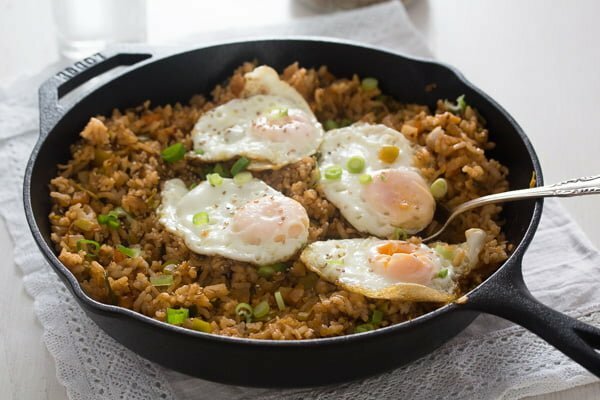 Super healthy and delicious kimchi fried rice or Korean kimchi bokkeumbap with eggs. I am so much into Korean (and Japanese) food lately, I cannot get enough of it. When it comes to Korean food, it all started with a rather large container of gochujang paste. I bought it to make some Korean oven baked chicken wings and I was hooked. I’ve made those particular chicken wings several times already, I used it to marinate chicken drumsticks and to make an amazing Korean chicken stew. And then there is the kimchi… So good! I buy the kimchi in a Russian supermarket and I have to say I can eat it with pretty much anything: as an accompaniment to a hearty stew (even if I cooked a Romanian or German stew that has no hint of anything Korean or Asian in it), I eat kimchi with bread and cheese, with polenta dishes or with meatballs… Whatever! Kimchi is a Korean dish of pickled vegetables. The best known kind of kimchi in our parts of the world is made with napa cabbage. But otherwise there are dozens and dozens of different kinds of kimchi. You could make it with other vegetables like white cabbage, different sorts of radishes, carrots, cucumber and so on. The kimchi I buy is usually made with white cabbage. In order to make kimchi, the vegetables are fermented with lactic acid bacteria and spiced with Korean red pepper gochugaru. Korean kimchi, like German sauerkraut or Romanian pickled cabbage, is full of nutrients and healthy microbes. The fermentation with the lactic acid bacteria is a natural process in which the bacteria feed on the sugar and starch in the food, creating the lactic acid and thus preserving the food. This natural fermentation preserves the nutrients in the vegetables and also makes them more digestible. The probiotics (good live bacteria and yeasts) are also formed during the fermentation process. This good bacteria helps improve digestion, it boosts immunity and helps us maintain a healthy weight. So, maybe it was time to go back to eating more naturally, the way our grandparents used to eat not long ago. I will always remember my grandmother saying that the last time she had had a fever was in the 1960s, I really never remember her having a cold. This might be linked to the fact that, especially in winter, there was not a day gone by without her eating some kind of pickled vegetable or another. I got my love for pickled vegetables from her, unlike my husband who only eats sauerkraut, rarely some gherkins and now kimchi, I could eat fermented vegetables every day. 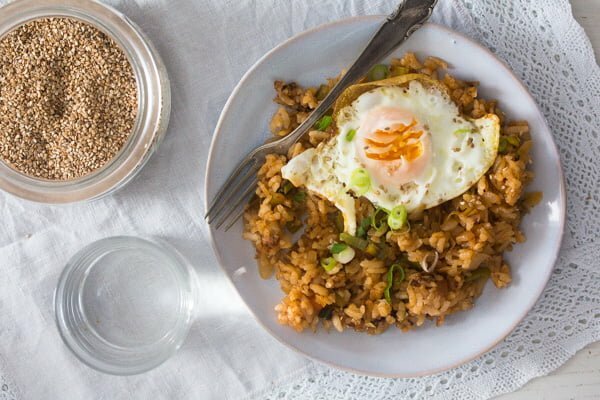 This is a very easy kimchi fried rice recipe using cheap and healthy ingredients. First of all, you will need the rice. The rice has to be cooked and cooled already. 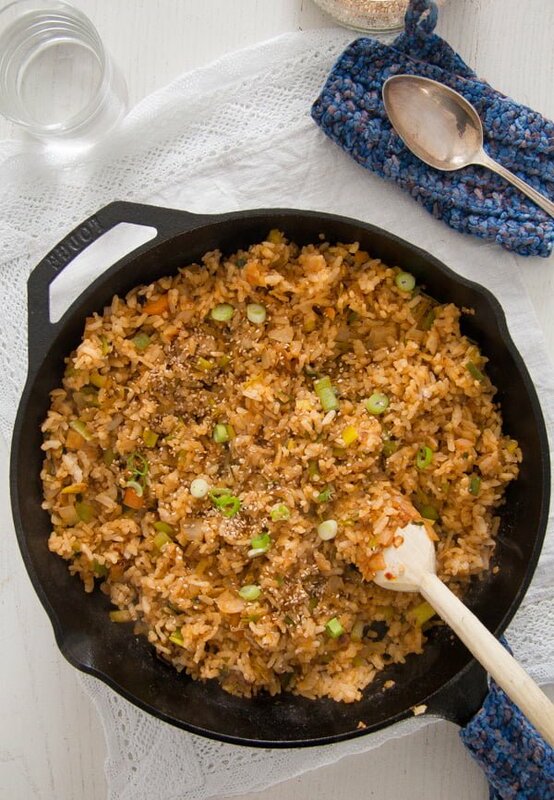 The best kind of rice to use for Korean bokkeumbap is short-grain white rice. 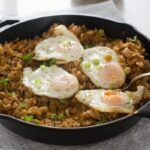 The rice needs to be cooked in advance, ideally the day before, but you could also cook it on the day you are cooking the kimchi fried rice recipe and leave it until completely cool. Rice leftovers can be used instead. As mentioned above, the best kind of rice to use for the Korean kimchi fried rice is short-grain, but if I happen to have basmati or regular rice leftovers I would use those as well. The consistency will be a bit different, but the kimchi fried rice will be equally delicious. 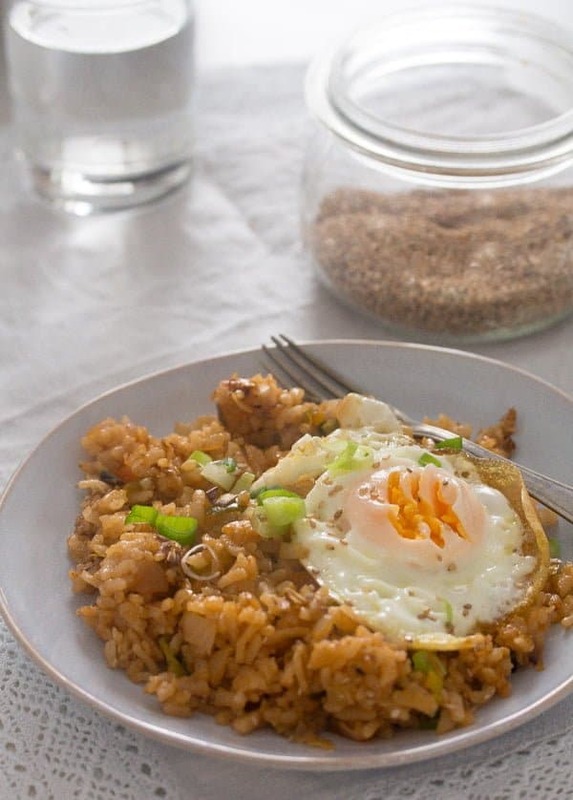 You will also need kimchi and some of its juices to cook the Korean kimchi fried rice recipe. I used about 250 g/ 8.8 oz kimchi, but a bit more or less is OK. Chop the kimchi and stir-fry it for a few minutes. Whisk the kimchi juice, soy sauce and gochujang paste together. Use gochujang paste to taste, I have seen recipes using 2 or 3 tablespoons of the paste, but that is definitely too hot for us. I added one tablespoon gochujang sauce to our kimchi fried rice and found that perfect. You could start with about ¾ tablespoon and add more to taste. I like adding a small amount of roasted sesame seed oil to many Asian dishes I cook at home. It is not mandatory, you should not buy it just for one dish, but if you have it or plan to cook more Asian food during the next months, then do get a small bottle of it. I also add some roasted sesame seeds on top of the finished kimchi bokkeumbap, they are almost a must for any Korean dish I happen to cook lately. Chop the kimchi, leek and green bell pepper. Chop the whites of the spring onions and leave the greens for garnishing the dish. Heat 1 tablespoon oil in a large pan over high heat. Add the kimchi, leeks, green pepper and scallion whites and stir-fry for about 3 minutes. Whisk together the kimchi juice, gochujang paste and soy sauce in a small bowl. Give the mixture to the pan together with the cooked rice. 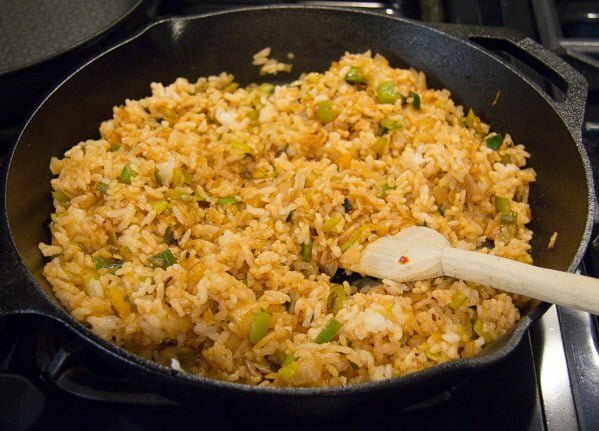 Mix well to combine and fry on medium low heat for about 3-5 minutes or until the rice is hot. Stir in the sesame seed oil and remove from the heat. 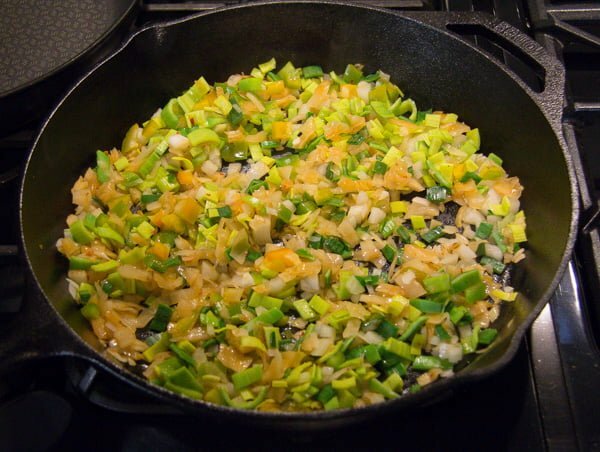 Heat the remaining tablespoon vegetable oil in a large pan. Fry the eggs to your liking. Sprinkle the kimchi fried rice with the chopped scallion greens and sprinkle some toasted sesame seeds on top. 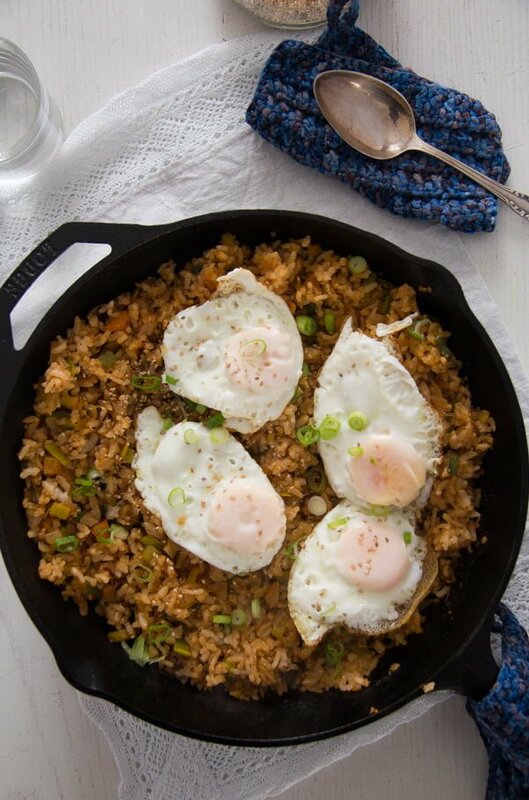 Serve immediately with the fried eggs. Note 1: Ideally, the rice should be cooked one day in advance. 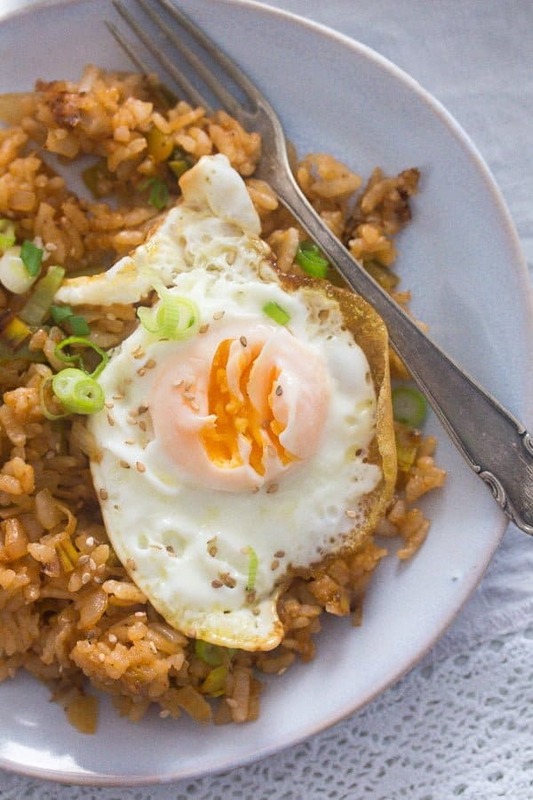 If cooking the rice on the same day, make sure it is completely cool before making the kimchi fried rice. 300 g/ 10.6 oz / 1 1/3 cups uncooked rice yield more or less 600 g/ 1.3 lbs/ about 4 cups cooked rice. Note 2: Start with ¾ tablespoon gochujang paste and increase the amount (up to 3 tablespoons – very hot!) according to your heat tolerance. I guess you really love kimchi! Kimchi, bread and cheese is a pretty interesting combo! I had kimchi regularly as a kid but not as an adult but should incorporate it into my diet now that I’m older and could benefit from its healthful qualities. 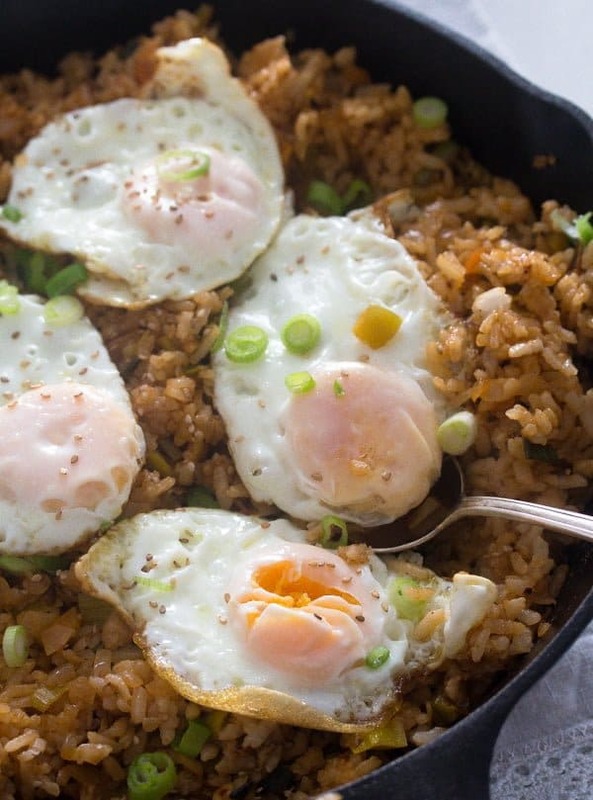 This fried rice looks delicious and flavorful! The eggs on top is a perfect finish! It looks like a perfectly healthy and flavourful meal! I’d love to try kimchi, but so far I haven’t seen a vegetarian option in shops. The one that I saw had some fish in it. Your dish looks amazing. I have just checked the kimchi I have in the fridge, no fish here. ☺ I would like to make kimchi at home soon, it is probably even better. 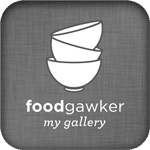 What a nice surprise to see a kimchi-based dish on your blog! I prepare kimchi quite often and love it in warm dishes. I must have now a year-old kimchi in the fridge and look forward to cooking it this weekend! The older the kimchi the better it’s in warm cooked dishes! I’m sure you’ll make fantastic kimchi as long as you use Korean chilli powder (if I may advise…) but I know it’s easy to buy on internet in every European country (this is how I buy it by the way).